Upon thinking back to the years that I first started learning to play guitar, I was fascinated by the guitars that I saw famous musicians playing. 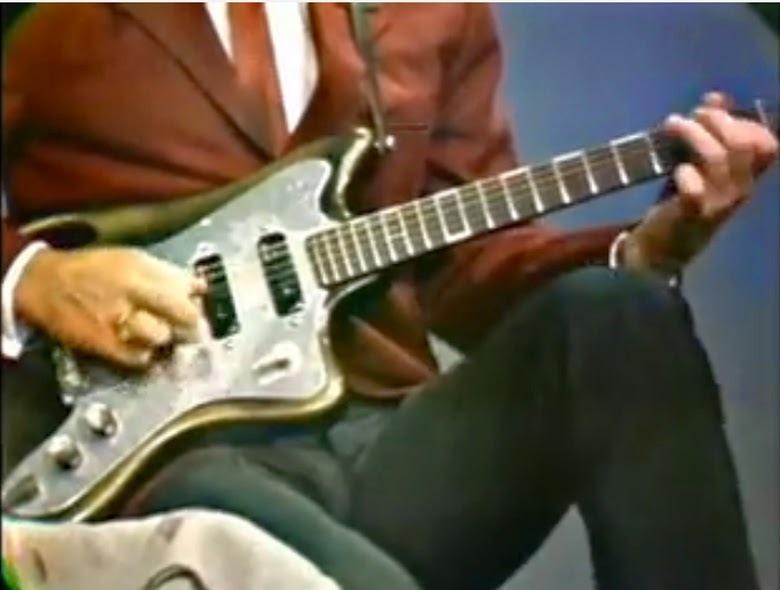 I can recall looking at fan magazines and seeing George Harrison and Gerry Marsden (Gerry and the Pacemakers) playing this unusual looking Fender guitar. At least to my young eyes it appeared to be a Fender. It was not until years later that I discovered both these guitars were Futurama guitars made in Czechoslovakia and imported to the U.K. As I have mentioned before the import duty on U.S. made products was extremely high because Britain was still paying off the War debt. So trade with the United States was not discouraged, but expensive. European instruments were readily available, so German and Italian instruments were plentiful. 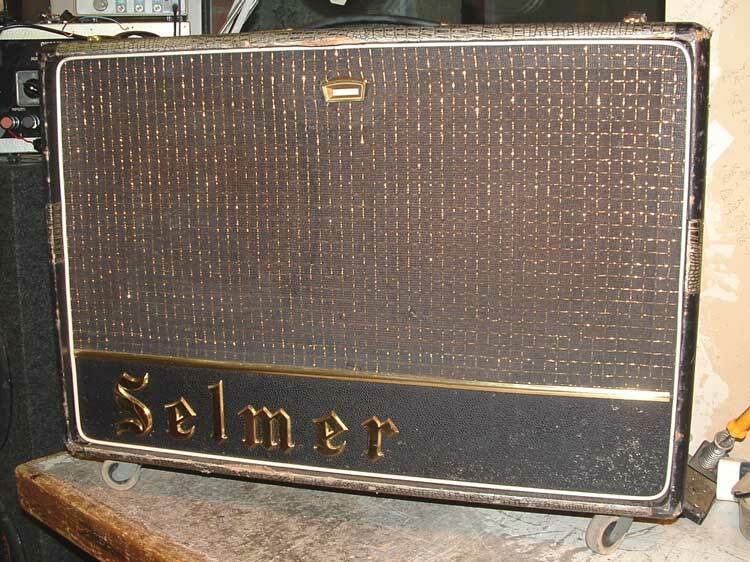 French-made Selmer amplifiers were very popular in Britain going back to the 1950’s. 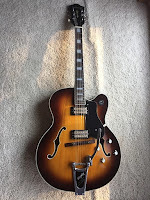 Around 1957 Selmer began importing a three pickup solid body guitar from the Drevokov Co-operative which was a manufacturer in Czechoslovakia that made furniture and electric guitars. The brand on the guitars was Resonet. 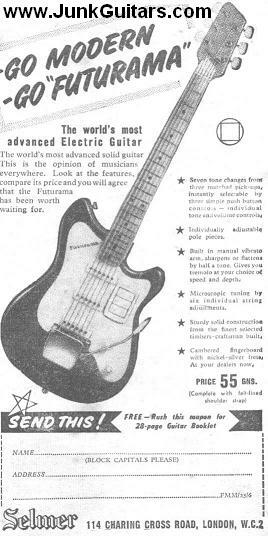 With its 3 single coil, plastic covered pickups with exposed pole pieces and it tremolo bar it was the closest thing to a Stratocaster to those on a budget. Selmer did not think the name Resonet was good for Rock and Roll, so the name was updated by Selmer to Futurama. Now mind you, this is the same company that produced Maccaferi's guitar. 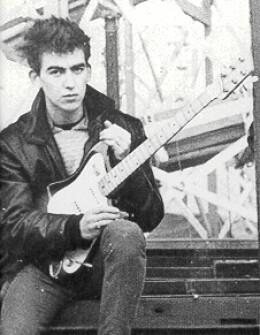 This very early version, called simply "Futurama" is the model that George Harrison used. It is characterized by the natural finished maple or sometimes beech body and neck, although some later ones did in fact have a rosewood fingerboard. The double sided headstock was fitted with three-on-a-plate tuners, and the white scratch plate covers the majority of the body top. Body material was either beech or maple. 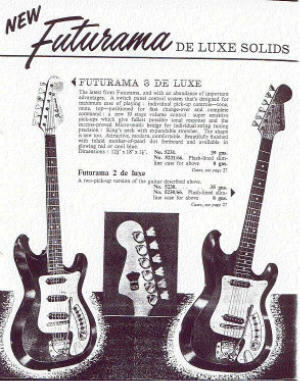 In 1959, the original Futurama Solid Guitar was replaced by a similar looking instrument that Selmer called the Futurama III. Some of the features on this guitar were modified from the original. The most visible was the change from light fingerboards to dark ones, to keep up with Fender’s switch. The tremolo bar assembly was improved upon. This guitar was manufactured by a different company, but it was still in Czechoslovakia. The company was called Czechoslovak Music Instruments or CSHN in Czech. The neck/fingerboard on Harrison’s guitar is probably maple that was darkened. The 3 on a side headstock is reminiscent of Leo Fender’s Telecaster prototype. I wonder if the manufacturers were aware of the similarity? I've already mentioned that guitar importers wanted their instruments to have Spanish sounding names to equate the instrument to being manufactured in Spain, which at the time produced the finest quality classical/flamenco guitar. 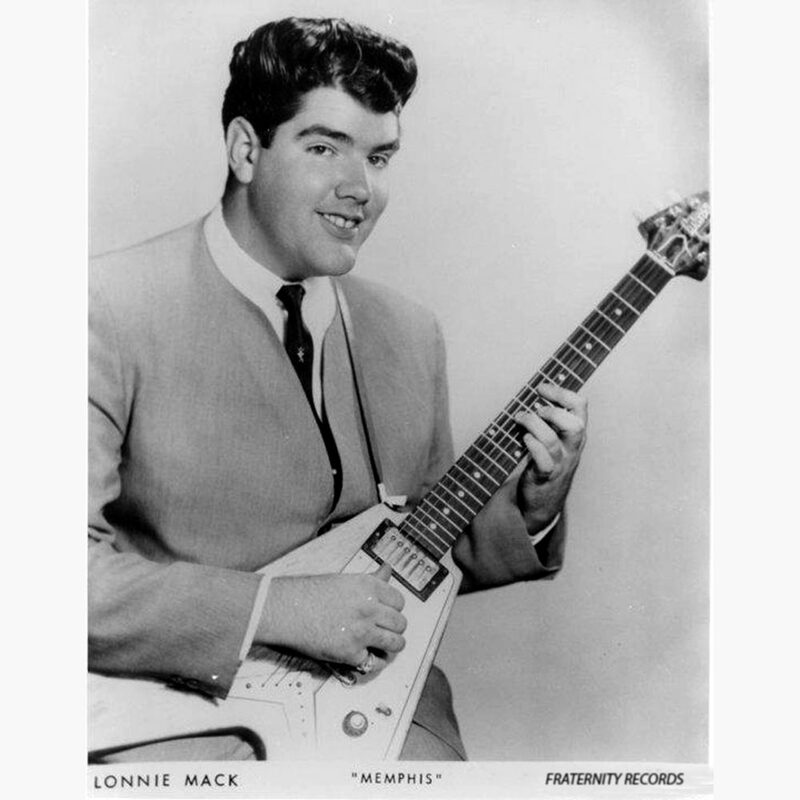 It was in 1960 when the company updated their guitars to have a six on a side headstock. The finishes went from just sunburst to offering a red finish as well. 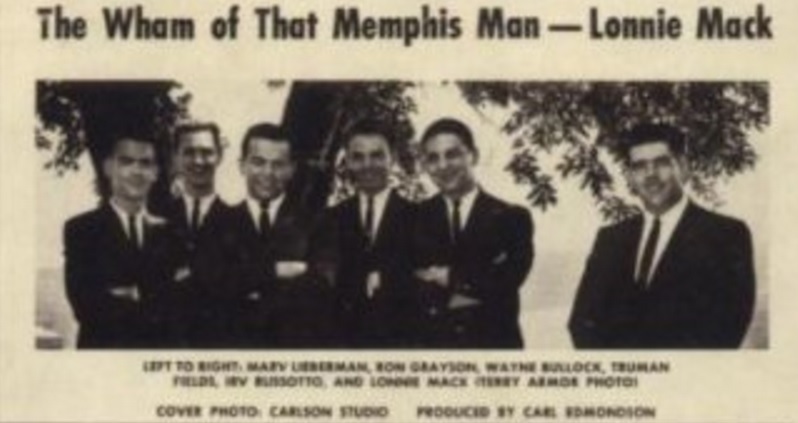 Selmer seems to have continued the line through 1963 and then dropped it from their catalogue. By then Hagström began using the Futurama name. 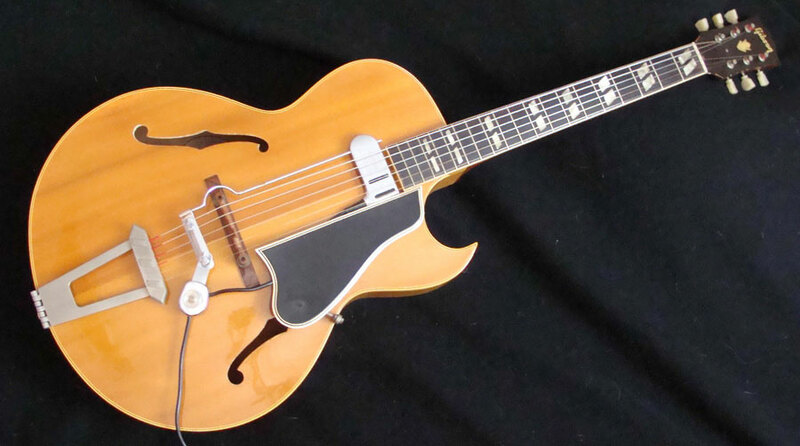 This evolved into an upscale version that Hagström called the Coronado. This guitar came in 3 versions and a bass. All models included accordion-like switches to control the pickups and tone. One model even had an acrylic fingerboard with the claim that it was impervious to warp and perspiration. Harry DeArmond invented the first commercially available attachable guitar pickup sometime in the 1930’s.. To market his invention he teamed up with Horace 'Bud' Rowe's Company, which was located in Toledo Ohio. It was there Rowe/DeArmond pickups, effects and amplifiers were manufactured. 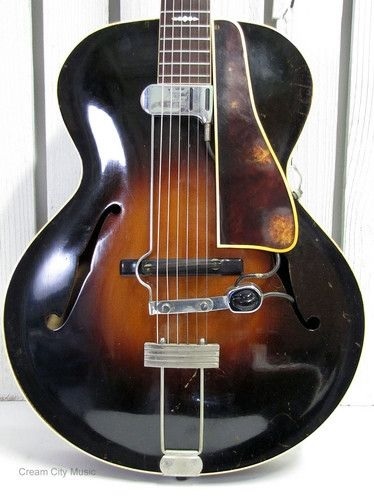 Originally the chief user of DeArmond pickups were guitar players looking to be heard above the sound of a big band. 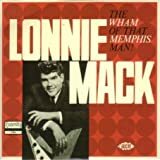 The other group of users were jazz guitarists seeking a clean sound and as well to be heard as well as a trumpet or drums. The original DeArmonds came in two styles. The RH was detachable and could be fitted over the soundhole of a flattop guitar by use of springs. 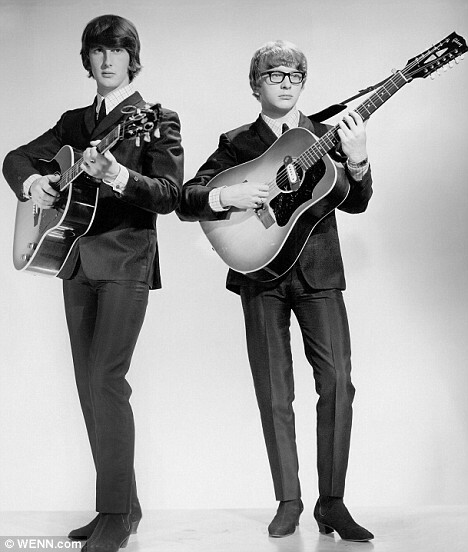 You see a lot of these on the acoustic guitars used by the British Invasion groups of the mid '60's. The FH used a metal brace that attached to the strings beneath the bridge and tailpiece of an archtop guitar. 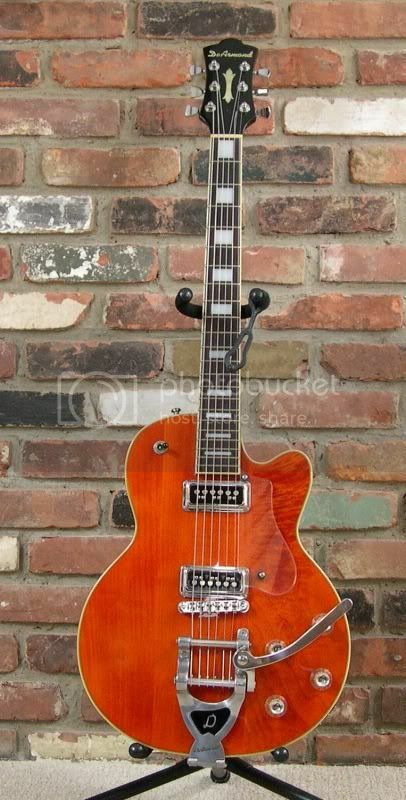 The older Gretsch guitars used DeArmond Dynasonic pickups. D’Angelico guitars featured DeArmond pickups. 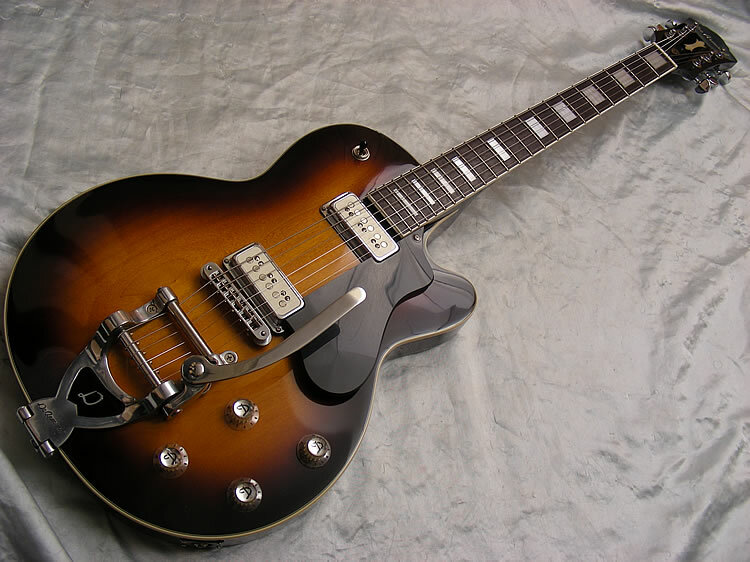 Guild electric guitars also featured DeArmond pickups. 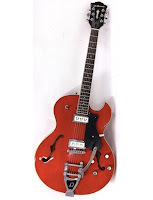 DeArmond guitars were based on older Guild electric guitars. 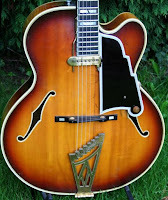 Guild opened its business in 1952 when Epiphone guitars went out of business. Many of the artisans that worked at Epiphone were hired by former employee Alfred Dronge and retailer George Mann. Originally located in Manhattan and then moved to larger facilities in Hoboken New Jersey. In 1966 the company was acquired by Avnet and moved its manufacturing to Westbrook Rhode Island where it continued until 1995 when Guild was acquired by Fender. Fender was on an acquisition spree at this time to diversify their product line up and add a well made acoustic product into the mix. Additionally Fender had acquired the rights to the DeArmond name and its pickups. It was in 1997 that Fender designed a series of guitars based on Guilds electric guitar lineup, but to be manufactured in Korea and Indonesia. 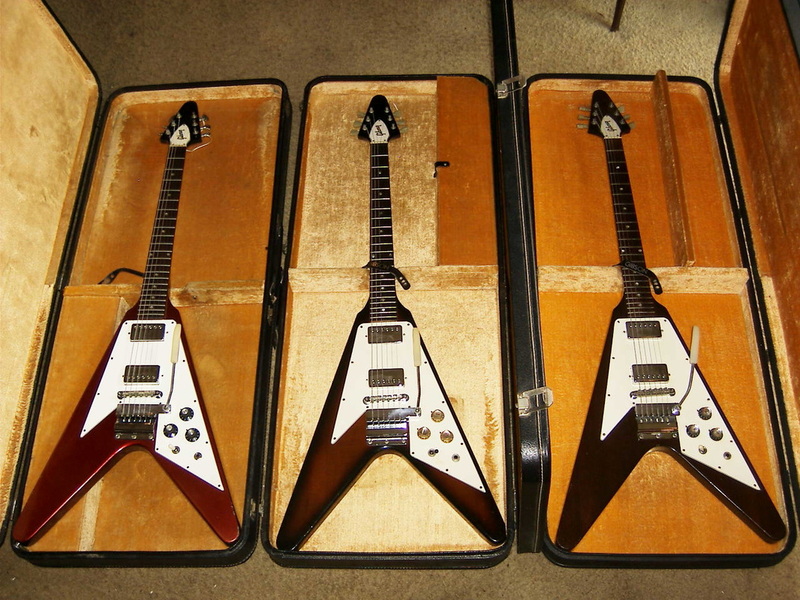 The plan was to ship the guitars to the United States and install the electronics including new DeArmond pickups. The pickups came in four varieties. The guitar pickups were the DeArmond 2K Single Coil and the DeArmond Gold Tone Humbucking pickups. The bass pickups were the DeArmond Turbo Jet Bass Single Coil and the DeArmond Gold Tone Bass Humbucking pickup. 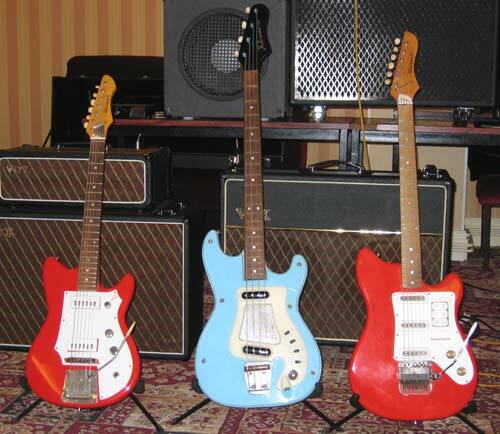 Fender test marketed the guitars, branded DeArmond in Europe and Asia and the line was very successful. 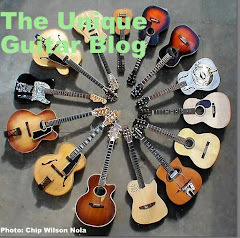 The guitars were later marketed in the United States and Canada and continued until 2004 when Fender suddenly dropped the line. Fender did sell one of the former DeArmond products under its Squire brand through 2005 or 2006, only it used different pickups. In 2004 members of the Fender Forum were notified by FMIC there was a big discount being offered through Musicians Friend to clear out Fender Musical Instruments Company’s stock of DeArmond guitars. 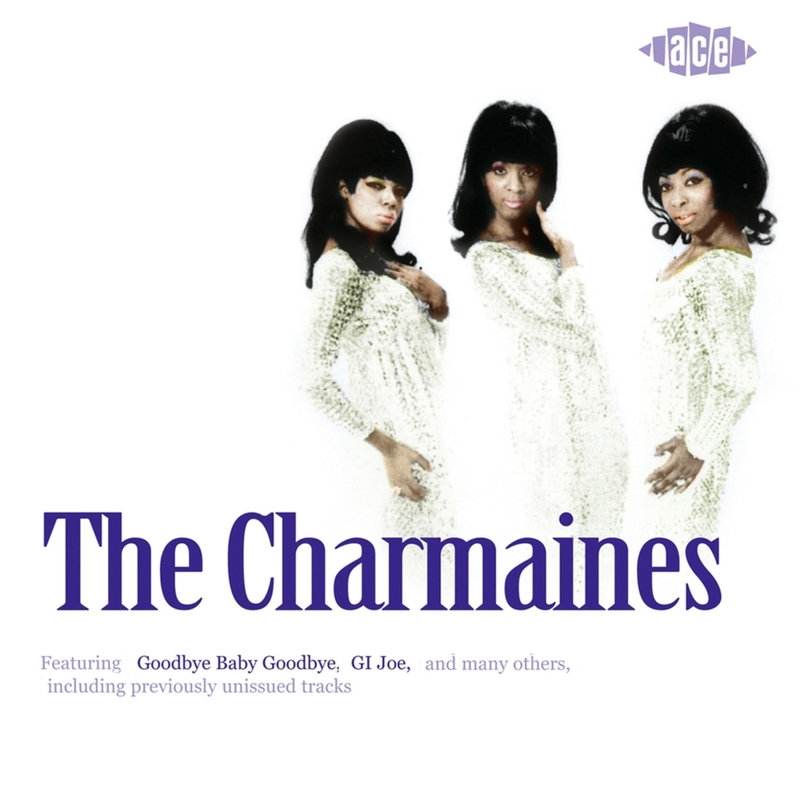 After that DeArmond guitars were no more. They can still be found on eBay at reasonable prices and are still excellent values. 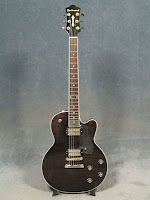 The Korean made DeArmonds are excellent guitars. The Korean instruments have set in necks, the fret markers are much nicer plastic versions. They are bound on the top with plastic trim and the logo is inlaid. The wood is superior using maple for the tops and walnut for the backs or solid mahogany for some of the models. The necks are made of mahogany. The Indonesian products are nice playing instruments, but are definitely inferior. The block fret markers on these are made of PVC, the necks are bolt-on, the pickups on some of the budget models are not DeArmonds, the wood is agathis and the headstock logo is a decal. 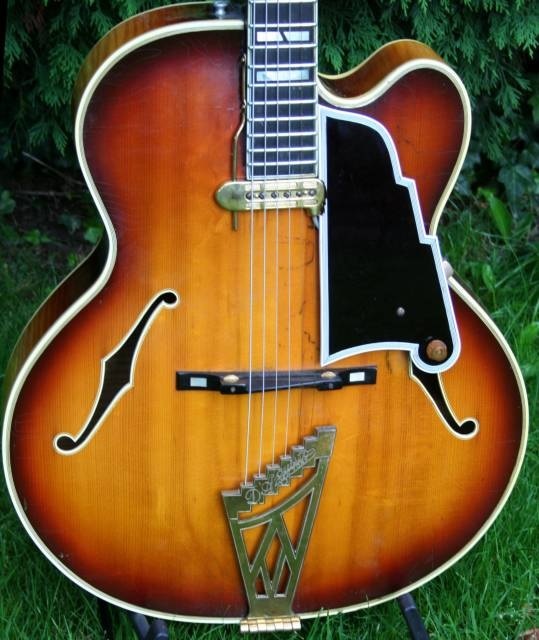 The hollowbody models, the X155 and the 400 are excellent jazz instruments. The X155 is a large bodied guitar with a Venetian cutaway and twin humbuckers and the 400 is a slim body single cutaway instrument with a single Florentine cutaway, a Bigsby style vibrato and twin 2k single coil pickups. There are also two semi-hollow instruments manufactured. The Starfire features twin Gold Tone humbucking pickups and double cutaway, while the Starfire Special is equipped with two single coil 2K pickups a Florentine cutaway and a Bigsby style vibrato. 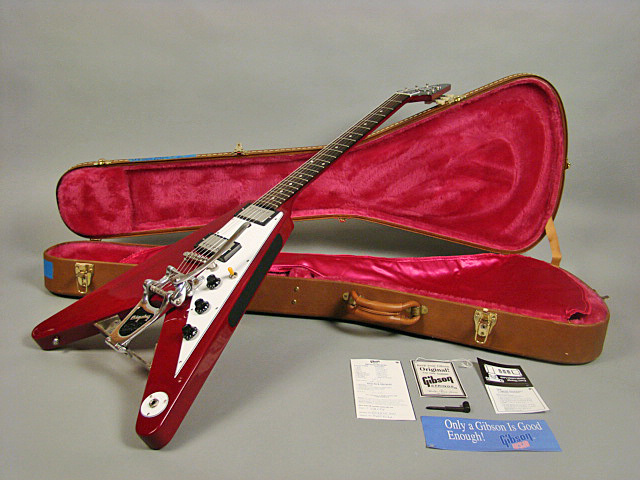 Both instruments were based on the Guild Starfire guitars. The solidbody instrument are based on two old Guild guitar designs, the M-75 and the S-10. These came in a variety of styles that went from budget models to player models. 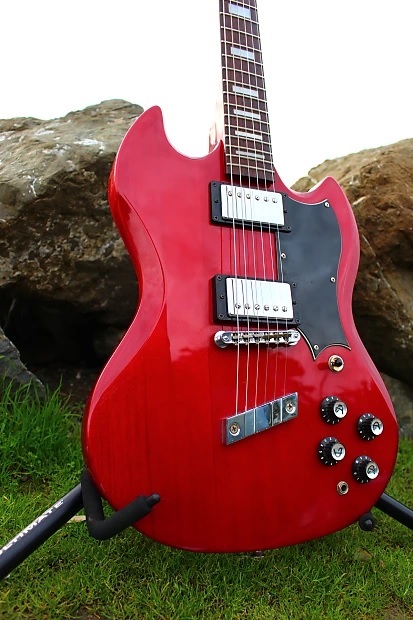 The budget guitars featured generic open humbucking pickups and bolt on necks while the nicer models featured either solid mahogany bodies or chambered bodies with walnut backs and maple tops. Some came with Gold Tone Humbuckers and some featured 2K single coils. The necks were set in, the bodies bound and the inlay was superior. S series 12 string and the S67 seven string model. 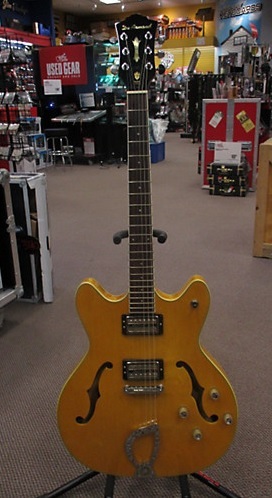 The DeArmond Jetstar bass guitars were based on the Gumby guitar shape and came with either two Gold Tone Humbucking pickups or two 2K single coil pickups. 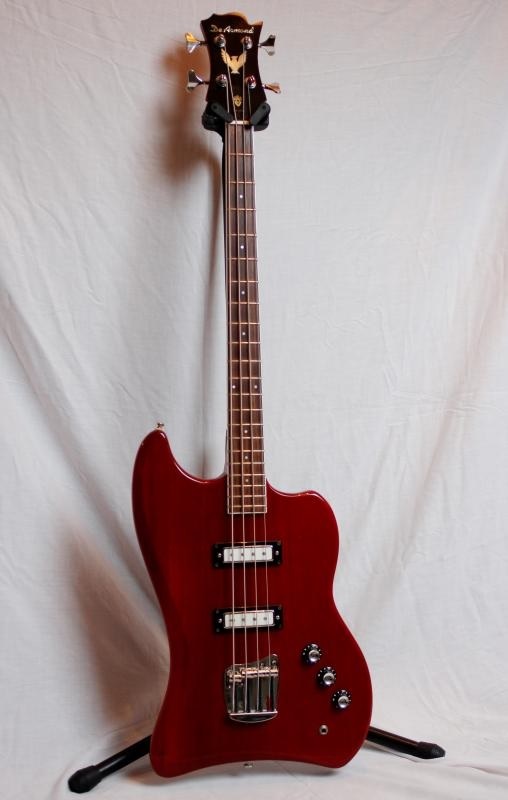 DeArmond also introduced the Pilot Bass which was a modern offset solid body bass that came in various styles and had Fender style bass pickups. 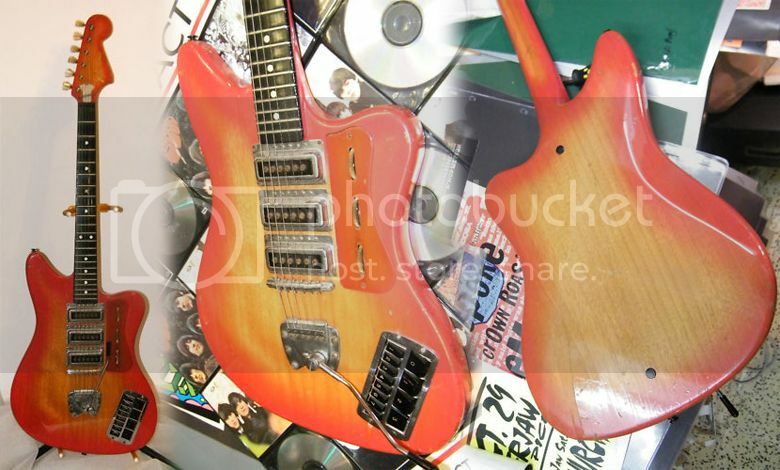 Another unusual DeArmond creation was the DeArmond Bajo Jet guitar. This is another "Gumby" style solid body that was a six string baritone guitar. It came with three DeArmond single coil 2k pickups. 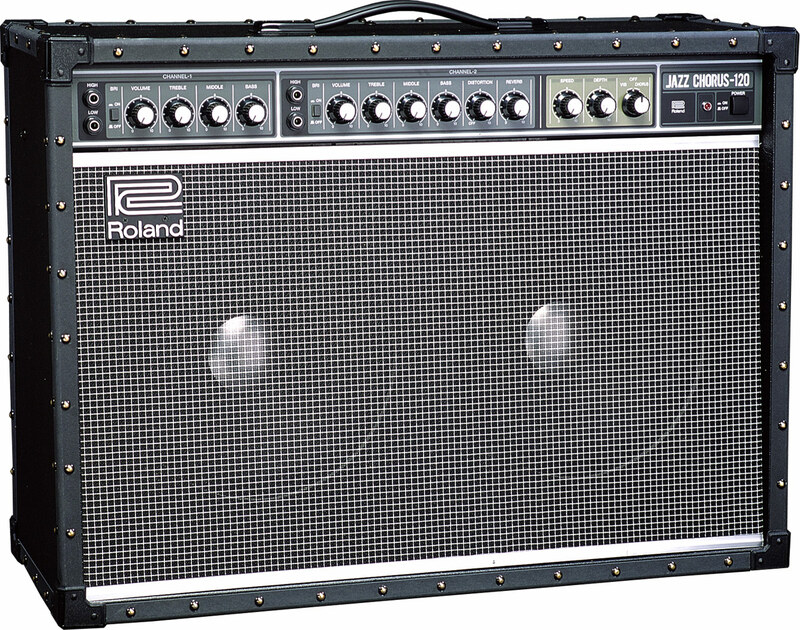 If you can find one, this has got to be a great addition for any guitarist. It had a set-in bound neck with dot position markers. One interesting feature is this guitars controls. There are one volume and one tone potentiometer for all of the pickups. The upper switch controls the neck and bridge pickups like on a twin pickup guitar. There is an extra switch that turns on the middle pickup and reverses the polarity. So you can have the middle pickup in phase or out of phase with the neck and bridge pickups. 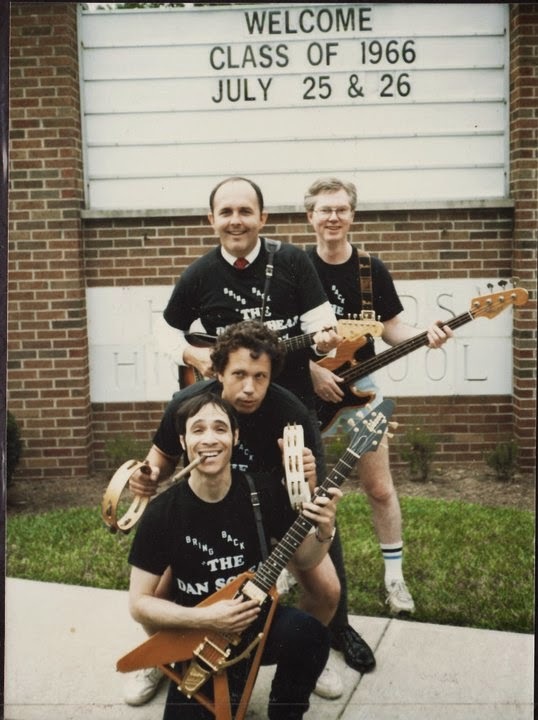 This unique instrument is still in production, however is sans the DeArmond brand and has gone back to just being the Ashbory bass. 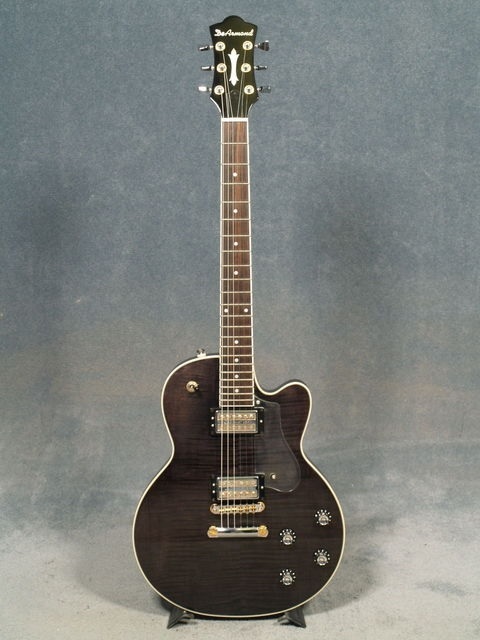 My personal favorite is the DeArmond M-72 with twin Goldtone pickups. Some of the leftover DeArmond guitars were re-branded as Squier guitars. This lasted for about one year until they were gone. Way back when I was 13 years old and knew everything about life, I discovered the guitar and submerged myself in all things guitar. 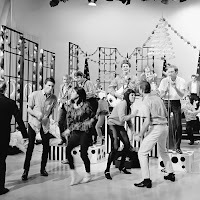 There were a couple of television shows on around this era (mid 1960’s) that were geared to young guys that liked guitars, drums, organs and bass and girls that liked the guys playing the guitars, drums, organs and basses. One of the shows was called Shindig! (with an exclamation point). Shindig! had everything that appealed to these two audiences. 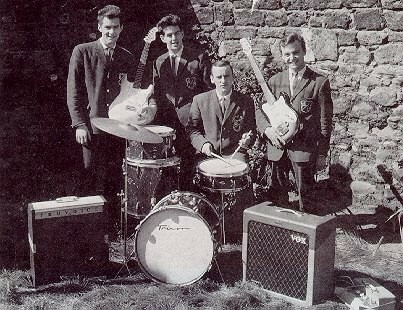 There were musicians, mostly imported from the U.K. that wore Mod clothes, played groovy instruments and had Fab haircuts. There were also dancing girls that wore min skirts and go-go boots. 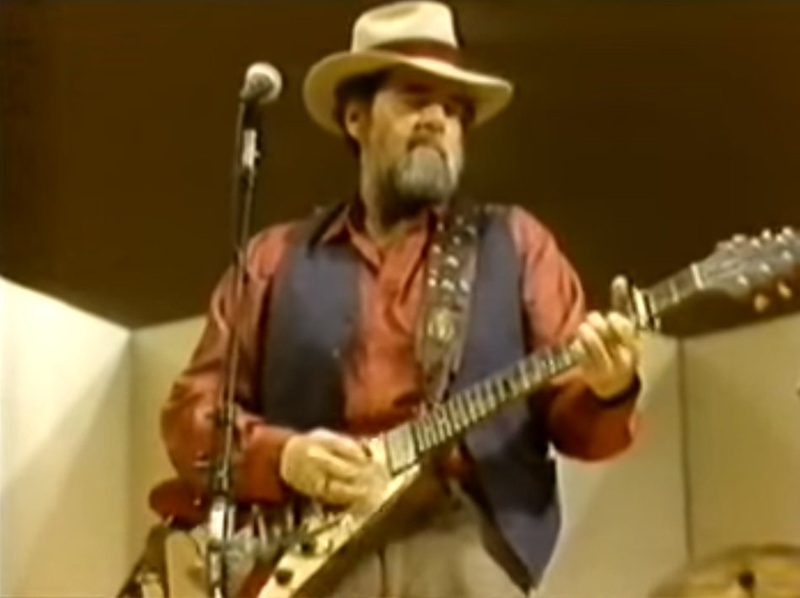 And the house band was at one time comprised of James Burton, Leon Russell, Delaney Bramlett and a few other guys. The show was hosted by a D.J. named Jimmy O’Neil that had that 60’s radio patter down pat. They also had a 'house band' called the Shindogs, which featured Glen Campbell, Billy Preston, Delaney Bramlett, Larry Knechtel (on bass), Leon Russell, Glen D. Hardin, Ray Pohlman and Bill Aken. 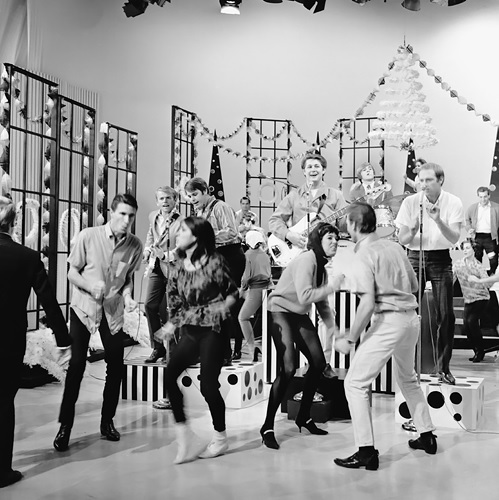 No one watching realized these were LA's top session players and members of The Wrecking Crew. 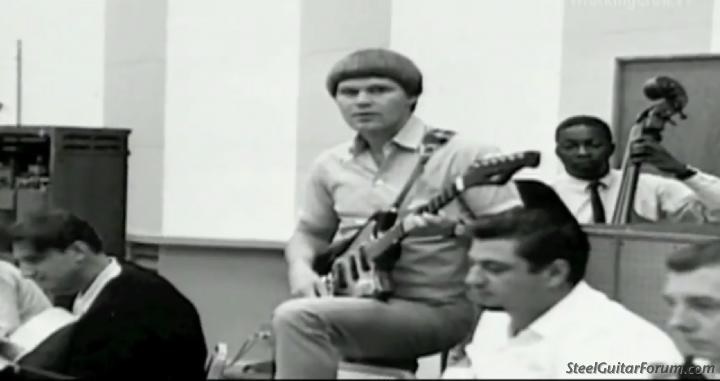 In those days James Burton was play a Fender Duo-Sonic instead of a Telecaster and the show's bass player used a Danelectro Longhorn bass, one of the things I found unusual about the show was the guitar preference of a young singer/guitarist named Glen Campbell. Most of the acts on Shindig played Gibson, Gretsch, Fender or Epiphone guitars exclusively. 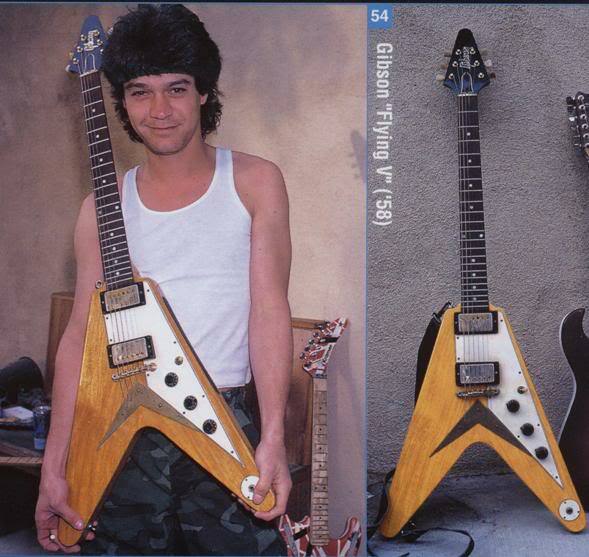 These were well known cool guitars. Campbell played this weird looking off brand type of guitar that looked sort of cheap. But as the song goes, he played that guitar like-a’ ringin’ a bell. 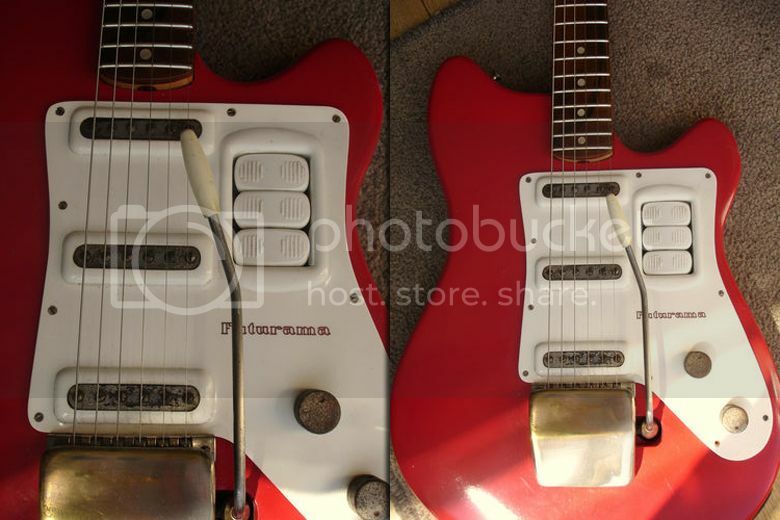 It turns out this was a Teisco Del Ray guitar. The Teisco brand name is an acronym for Tokyo Electric Instrument and Sound Company. The original name was Aoi Onpa Kenkyujo, which translated is Hollyhock Soundwave or Electricity Laboratories, which is a mouth full in any language. 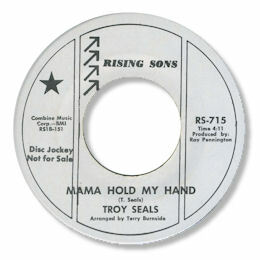 By 1964 the tag Del Ray was added. This has happened several times during Asian guitar history to make the brand sound Spanish. Greco is another company that comes to mind. 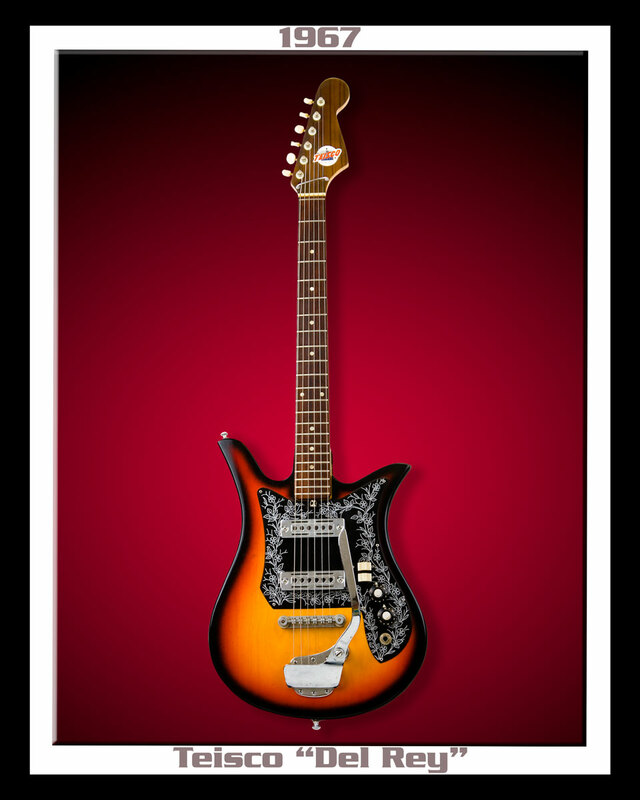 Teisco was acquired by Kawai Musical Instruments in 1968 and the guitar brand was discontinued in 1969. I believe the English translation for Kawai is "that appears to be a piano, but is not." 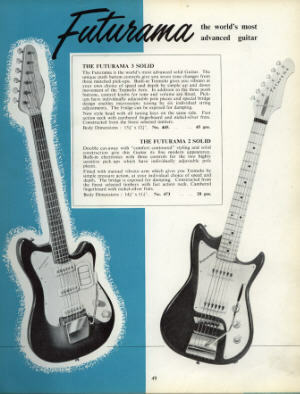 Teisco produced a six-string bass similar to the Fender Bass VI. The guitar version of this instrument was what Campbell is playing, although it is definitely strung with normal guitar strings. 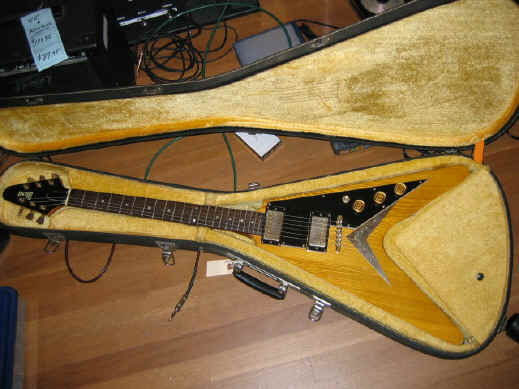 The shape is off-set and somewhat like a Fender Jazzmaster, however the top horn is extended and there is a handle cutout on the lower bout as well as on the headstock. This guitar was offered in 1960 through '61 and did not have the Del Ray designation. The bridge saddle looks like it is right off of an old Telecaster. I have read somewhere that Campbell made good use of this instrument on a number of recordings for other artists. 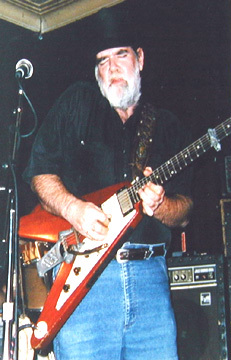 Before becoming a major television and recording artist, Campbell had a successful career as a sought after session guitarist. Ibanez; another Asian company that revived this concept when they introduced the Jem series of guitars for Steve Vai. Most guitarists today call this is a Monkey Grip.